Use H9 light bulbs for Low Beam and H9 light bulbs for High Beam. Package comes with left and right side headlights for direct replacement. Installation requires taking out the bumper and wiring the halo or LED to the battery if necessary. Professional installation is highly recommended. 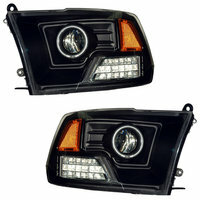 These headlights are can be upgraded to Xenon HID headlights with our HID conversion kit. If your car has stock HID, these HID will STILL fit, but extra parts is required for installation, please contact us for more detail.. If you want to purchase HID conversion kit with these headlights, visit our store to get the HID kit with the correct bulb size. CCFL Advantages: 1. Designed with thick PVC plastic for an enhanced three-dimensional appearance. The light refraction of the engraving pattern has been optically tested in order to allow optimal illumination. 2. Utilizes UV optical materials to ensure product durability and high levels of transparency. 3. Electronic insulation uses metallic electrolytic materials to maximize levels of brightness. CCFL Lighting Tubes: 1. Incorporates currently the most advanced tubular electrodes from Japan, which are superior to the commonly used rectangular electrodes in other products. This technology minimizes dimming of the cathode and anode ends and ensures that there are no blind spots. In addition, it enhances the lifespan of the lighting tubes by 1.5-2 times. 2. Uses superior and stable fluorescent powder, which guarantees a lighting lifespan of 15000-20000 hours and consistency in lighting color. 3. Built with thick and impact resistant glass tubing. 4. Integrates anti-vibration plastic tubing to prevent product breakage. 5. Color temperature performs at 7000K. Circuit: Requires small current for regulation and is highly efficient, both saving electricity and allowing for an extended lifespan.